July 23, 1851. | 10 Stats., 949. | Proclamation, Feb. 24. 1853. 1st. To the chiefs of the said bands, to enable them to settle their affairs and comply with their present just engagement; and in consideration of their removing themselves to the country set apart for them as above, which they agree to do within two years, or sooner, if required by the President, without further cost or expense to the United States, and in consideration of their subsisting themselves the first year after their removal, which they agree to do without further cost or expense on the part of the United States, the sum of two hundred and seventy-five thousand dollars, ($275,000):Provided, That said sum shall be paid to the chiefs in such manner as they, hereafter, in open council shall request, and as soon after the removal of said Indians to the home set apart for them, as the necessary appropriation therefor shall be made by Congress. Signed in presence of Thomas Foster, Secretary. Nathaniel McLean, Indian Agent. Alexander Faribault, Stephen R. Riggs, Interpreters. A. S. H. White; Thos. S. Williamson; W. C. Henderson; A. Jackson; James W. Boal; W. G. Le Duc; Alexis Bailly; H. L. Dousman; Hugh Tyler. 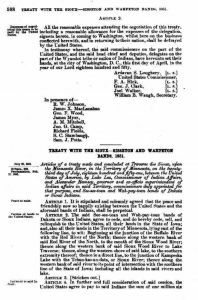 In part consideration of the foregoing cession, the United States do hereby set apart for the future occupancy and home of the Dakota Indians, parties to this treaty, to be held by them as Indian lands are held, all that tract of country on either side of the Minnesota River, from the western boundary of the lands herein ceded, east, to the Tchay-tam-bay River on the north, and to Yellow Medicine River on the south side, to extend, on each side, a distance of not less than ten miles from the general course of said river; the boundaries of said tract to be marked out by as straight lines as practicable, whenever deemed expedient by the President, and in such manner as he shall direct:” which article has been stricken out of the treaty by the Senate, the said payment to be in lieu of said reservation: the amount when ascertained under instructions from the Department of the Interior, to be added to the trust-fund provided for in the fourth article.